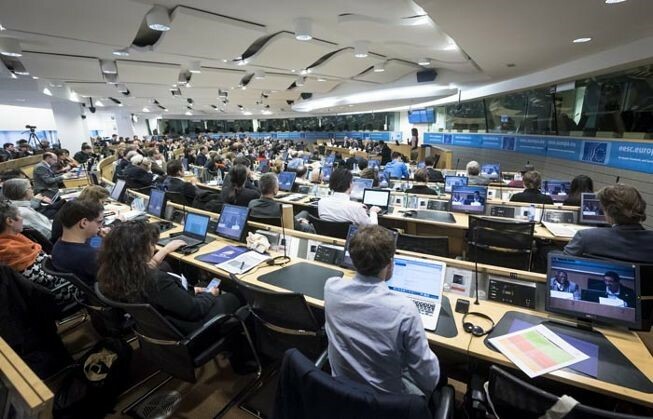 Responcibility smallThe European Economic and Social Committee (EESC) and the projects GREAT, ResAgora, Responsibility and Progress (Go4 projects) organised the conference “RRI Shaping new Horizons: Responsible Research and Innovation in Europe and across the World”, which was held at the EESC premises, in Brussels, on 14 – 15 January 2016. 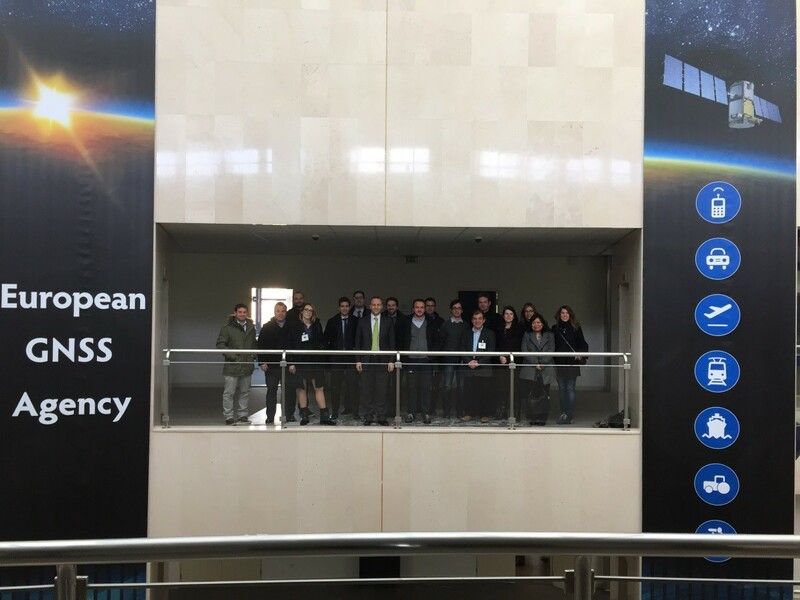 GeoImaging Ltd integral partner of the Responsibility project attended the 2 days conference and disseminated results of the project and especially the OBSERVATORY and its current functionalities. 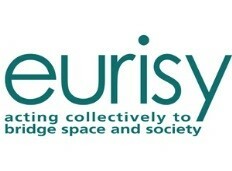 The Responsibility OBSERVATORY and Forum is a holistic networking platform where research and innovation stakeholders can be informed and interact on elements of Responsible Research and Innovation RRI. 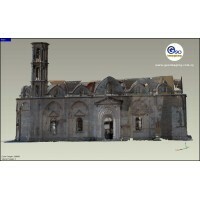 Please find more on the event and download the presentations here. 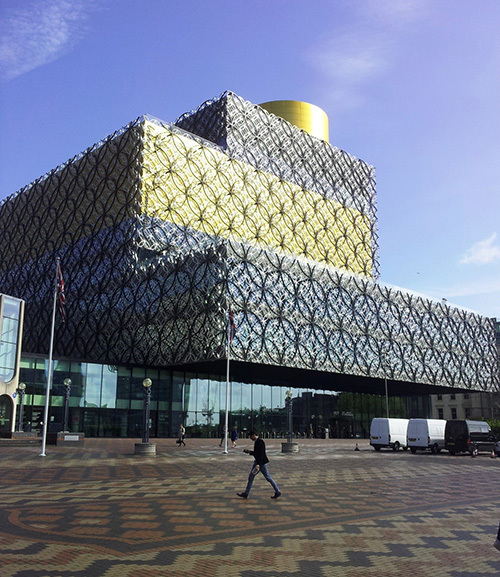 Visit the Responsibility Project Observatory and learn about RRI here. 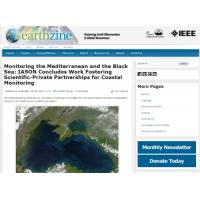 Monitoring the Mediterranean and the Black Sea: IASON Concludes Work Fostering Scientific-Private Partnerships for Coastal Monitoring. 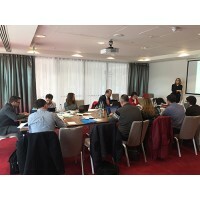 The IASON project concludes its two-year efforts to build upon knowledge from prior partnerships and improve sustainability research in the Mediterranean and Black Sea regions. 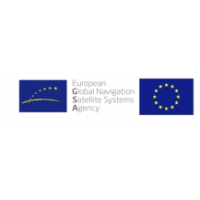 Project LARA, “LBS Augmented Reality Assistive System for Utilities Infrastructure Management through Galileo and EGNOS”, kicked – off February the 10th 2015 in Prague, Czech Republic at the premises of the European GNSS Agency. The necessity for monitoring geo-risk areas such as rock slides or avalanches is growing due to the increasing probability of such events caused by environmental change. Europe is one leader in survey technology. The project DE-MONTES – funded by the EU research framework programme – provides an efficient, highly automated, high-resolution, terrestrial, long range sensing measurement and analysis system which is able to monitor georisk (and related) objects. 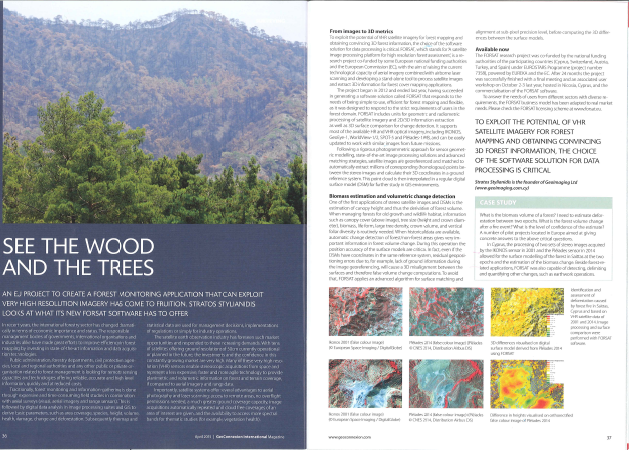 GeoImaging Ltd participated in DE-MONTES project as an SME partner and launched the project pilot in Nicosia focusing on the impact of environmental changes on man-made objects. 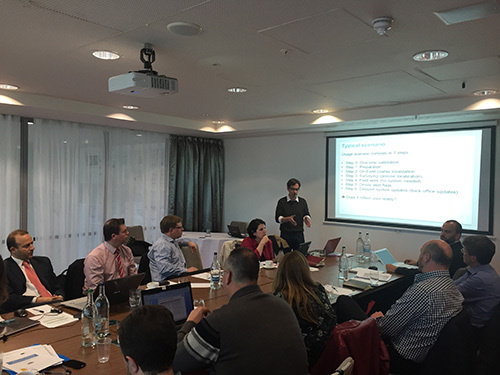 Project LARA that kicked – off February 2015 is organizing the second project meeting 21 & 22 May 2015 in Birmingham, UK. 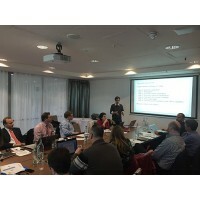 During the meeting in Birmingham a validation workshop will be launched where real end-users from the gas utility company, the electric utility company and the national grid and water public company will be called to validate the LARA usage scenarios under development. 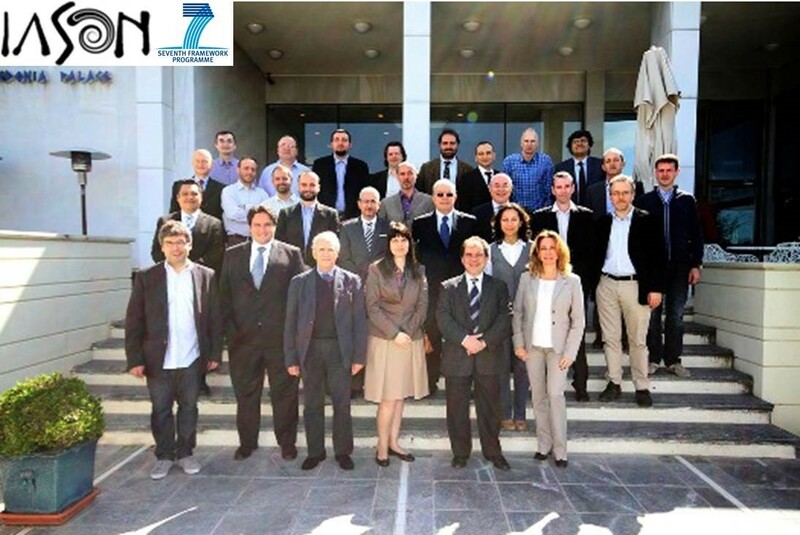 About LARA project: The nine partner international consortium, led by the Cypriot SME GeoImaging Ltd, will develop during the next 24 months a mobile device to assist the utility management professionals on the field. 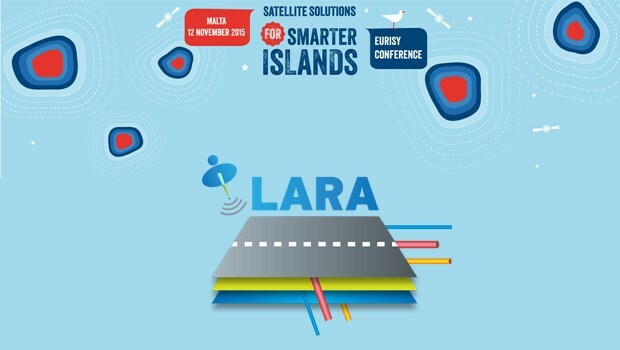 The LARA system will allow utility management companies to know exactly “where is what”, conducting far more accurate interventions regarding maintenance of their own underground infrastructure while keeping intact other neighboring underground grids. Precise intervention will reduce the overall maintenance cost, minimizing at the same time economic and social implications of lengthy surface works. GeoImaging Ltd, offering a wide range of 3D surveying services and being active in numerous relevant research initiatives has always had a vivid interest to maintain strong ties with the local academic community. Therefore, the invitation by the school of Civil Engineering and Geoinformatics Engineering of the Technological University of Cyprus to participate in a series of presentations regarding issues of Survey Engineering was well received. 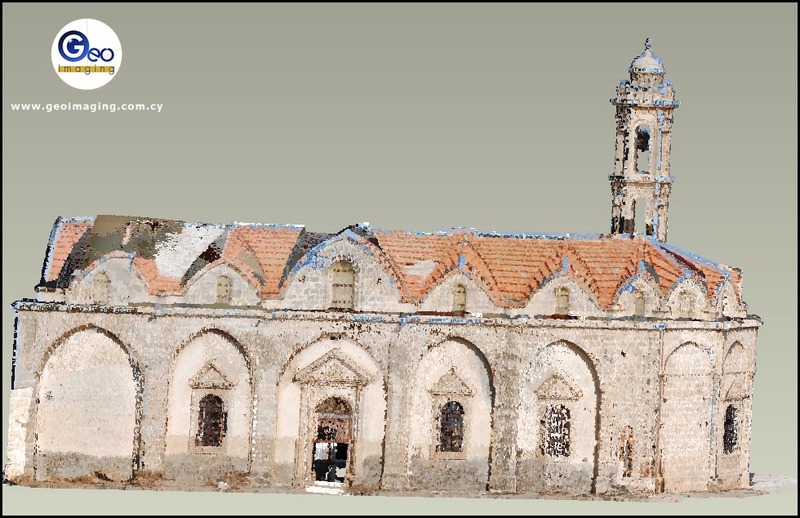 Within this framework Mr. Aris Anastasiades, Director of GeoImaging Ltd, presented the 22nd of April, state of the art methods of 3D surveying of buildings and monuments applied by our company within various surveying projects. During the presentation and the discussion that followed the mixed audience of students and academic stuff had the opportunity to learn about the possibilities of the new technologies and reflect on the research and business opportunities for future applications in Cyprus and abroad. 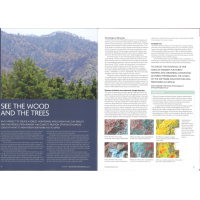 Τhe international magazine GeoConnexion in the April's edition makes an extensive reference to the EU funded EUREKA research project FORSAT in which Geoimaging took part. 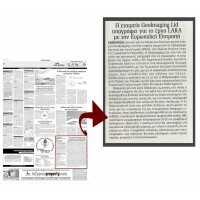 One of the most popular newspapers in Cyprus,"Phileleftheros" www.philenews.com/ ("Φιλελεύθερος"), published an article on the coordinating role of Geoimaging Ltd in the project "Lara" which part of the HORIZON 2020. 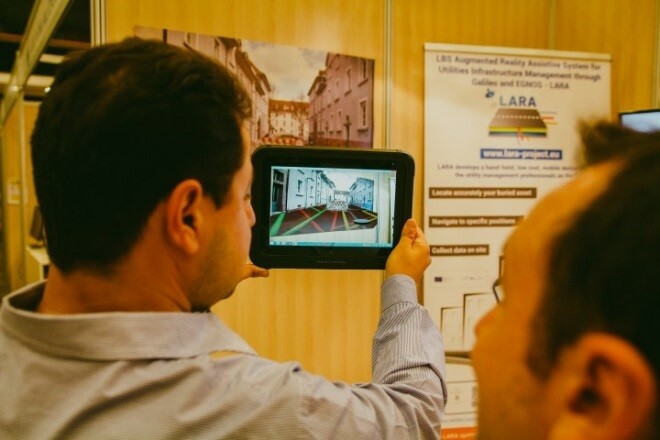 Project LARA, “LBS Augmented Reality Assistive System for Utilities Infrastructure Management through Galileo and EGNOS”, kicked – off February the 10th 2015 in Prague, Czech Republic at the premises of the European GNSS Agency. 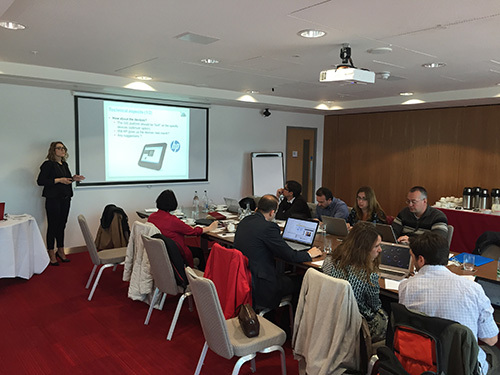 The nine partner international consortium, led by the Cypriot SME GeoImaging Ltd, will develop in the next 24 months a mobile device to assist the utility management professionals on the field. The hand-held, low cost, mobile device will integrate state-of-the-art technologies in the domain of positioning and sensors (GNSS), Augmented Reality (AR), 3D GIS geodatabases. The LARA system will guide utility field workers by helping them ‘see’ beneath the ground, rendering the complexity of the 3D models of the underground grid such as water, gas and electricity. 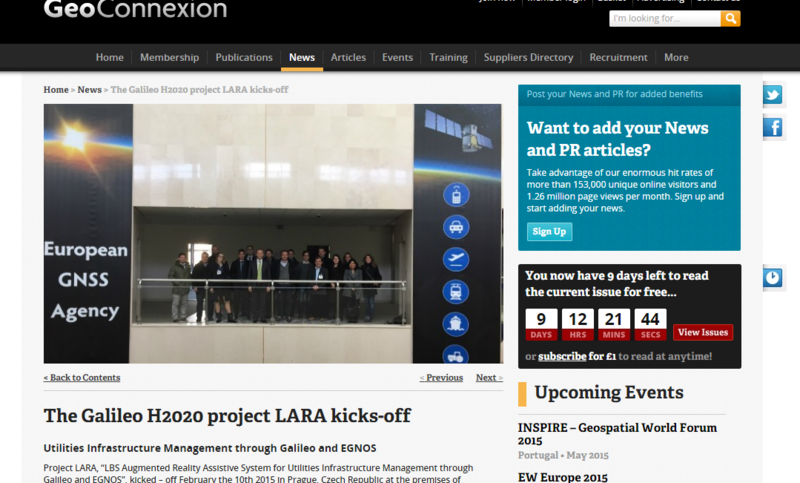 The LARA system will allow utility management companies to know exactly “where is what”, conducting far more accurate interv¬¬entions regarding maintenance of their own underground infrastructure while keeping intact other neighbouring underground grids. Precise intervention will reduce the overall maintenance cost, minimising at the same time economic and social implications of lengthy surface works. 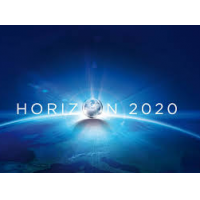 LARA project with an overall budget of 1.282.397,50 € has received funding from the European GNSS Agency under the European Union’s Horizon 2020 research and innovation programme under grant agreement No 641460. 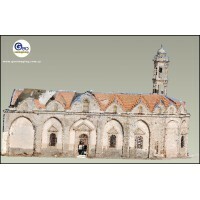 On February 8, 2015 on the occasion of the feast of Saint Charalambos, the holy mass will take place for the second consecutive time in the occupied village Kontea. 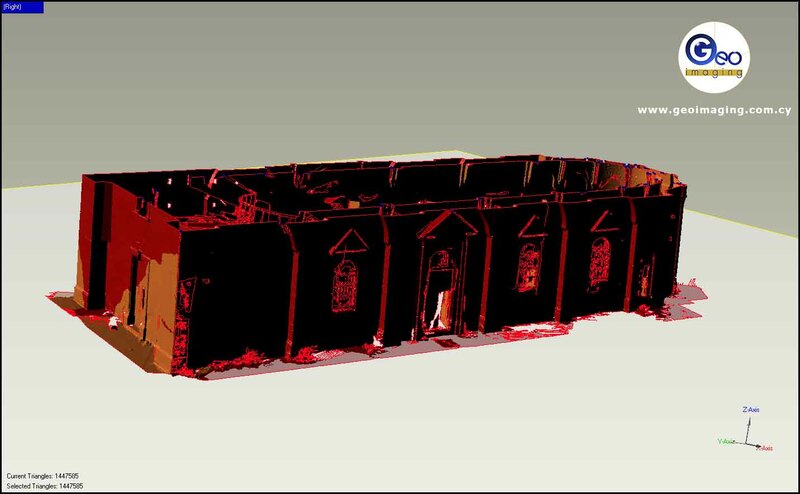 The GeoImaging Team feels pleased to have participated in the project for the maintenance of the church and for contributing using a 3D Laser Scanner for the measurements and for the creation of 3D drawings. 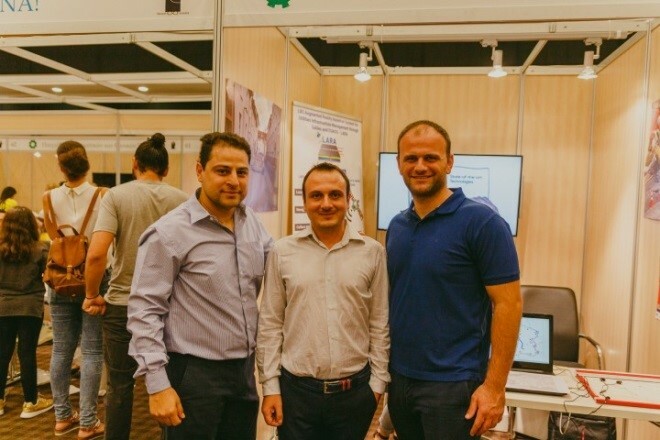 GeoImaging Ltd, coordinator of LARA project participated in the “Researcher’s Night” event held at the FILOXENIA International Conference Centre in Nicosia on the 30th of September 2016. 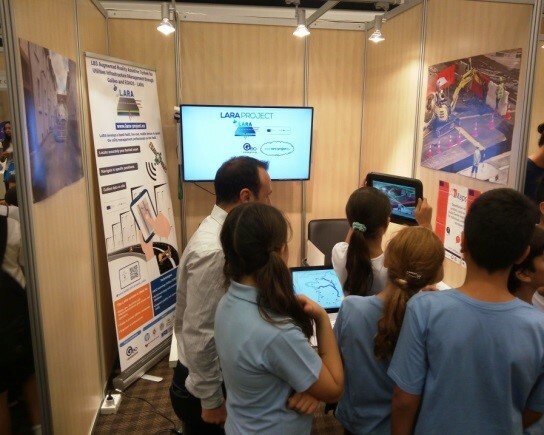 From 17:00 until 24:00 students and adults visitors were informed on the project’s objectives and got in touch with state of the art technologies being implemented at the moment within LARA project. Highlight of the night was the LARA augmented reality demonstrator where visitors navigating through the camera of one of the tablets of the project, augmented underground grids on a fixed panel. 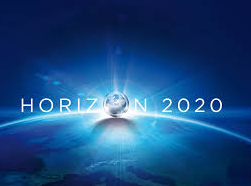 GeoImaging wins a place in the 25 Projects Awarded Horizon 2020 Funding! 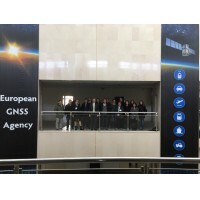 The European GNSS Agency (GSA) has signed funding agreements with 25 projects as part of the first call of Horizon 2020. 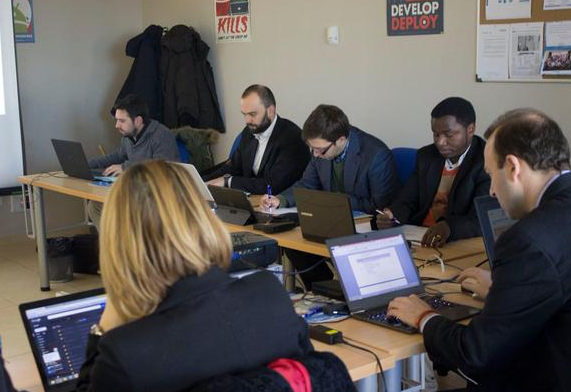 Under the agreements, the projects will receive a cumulative grant of EUR 37,096,177. The first call saw the submission of 105 proposals addressing all market segments. Of particular note were the high scores of these submissions – raising the competition among upcoming calls. Ultimately, those proposals that best maximized the technical aspects as well as market potential were selected for funding. 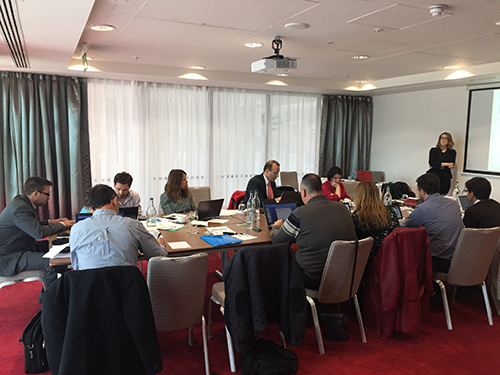 GeoImaging Ltd signs LARA project Grant Agreement with the European Commission: LARA Project kick-off meeting 10-11 February 2015, in Prague. 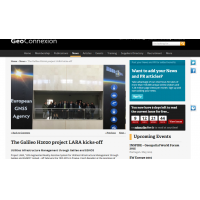 The H2020-Galileo-2014-1 project Lara “LBS Augmented Reality Assistive System for Utilities Infrastructure Management through Galileo and EGNOS” kicks-off. 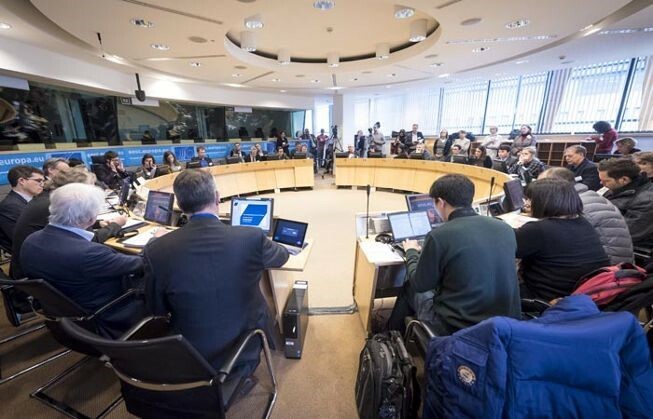 GeoImaging Ltd, coordinator of LARA project signed January the 20th the Grant Agreement (Project total cost: €1,282,397.50) with the European Commission. 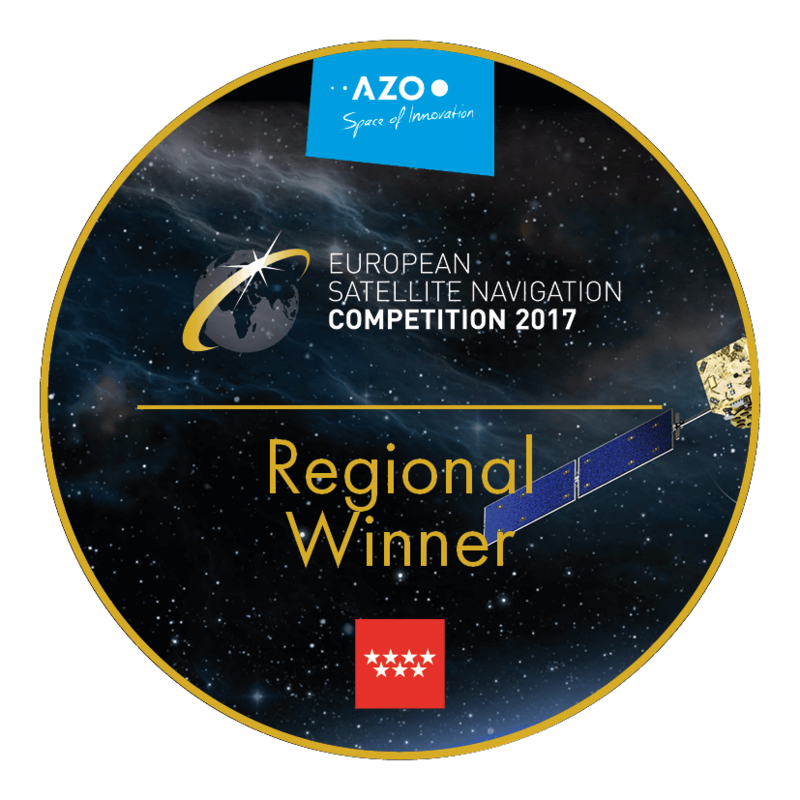 The project will kick-off the 10th and 11th February 2015 in Prague Czech Republic and the meeting will take place at the premises of the European GNSS Agency. 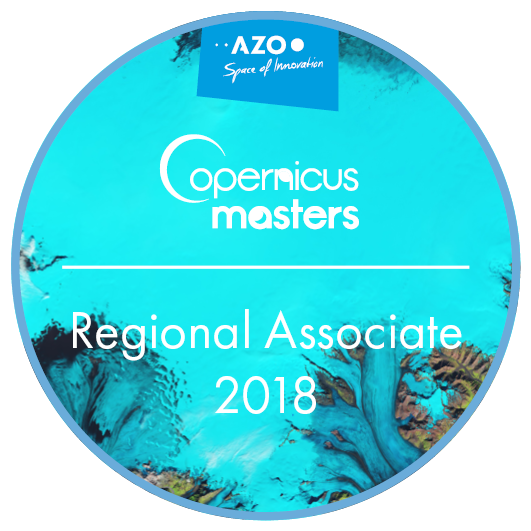 Our company for the next 24 months will act as the coordinator of a 9 partner international consortium that has the main objective to develop a mobile device for utility field workers. The hand-held device integrates different technologies such as: positioning and sensors (GNSS), Augmented Reality (AR), GIS, geodatabases, etc. In practice, this device will guide the field workers in underground utilities to ‘see’ what happening underworld, like an “xray image” of the underground infrastructure. The system is using Augmented Reality interfaces to render the complex 3D models of the underground utilities infrastructure such as water, gas, electricity, etc. in an approach that is easily understandable and useful during field work. 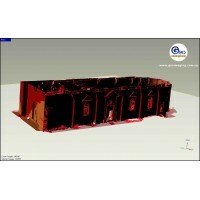 The 3D information is acquired from 3D GIS geodatabases. Hardware giant Hewlett Packard, also member of the LARA consortium, will help in the development of the system providing at the same time a huge commercial distribution network. 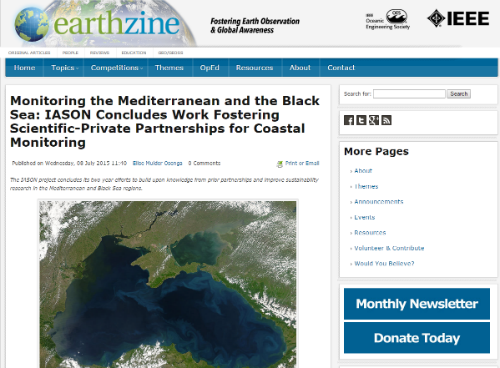 As Aristodemos Anastasiades, Director of GeoImaging ltd underlines, “Coordinating LARA project and working with companies like HP, is a great opportunity for an SME from Cyprus to move to the forefront of European Research & Innovation, improve our competitiveness and deliver a huge boost to our service portfolio”. 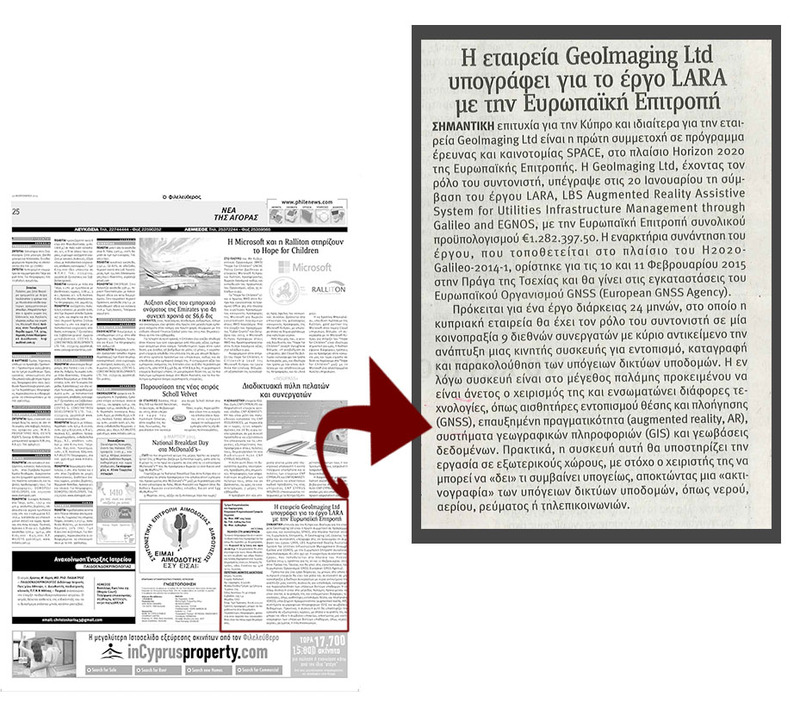 GeoImaging will cooperate closely with another innovative SME from Cyprus, SIGNALGENERIX Ltd which is also partner of LARA project. 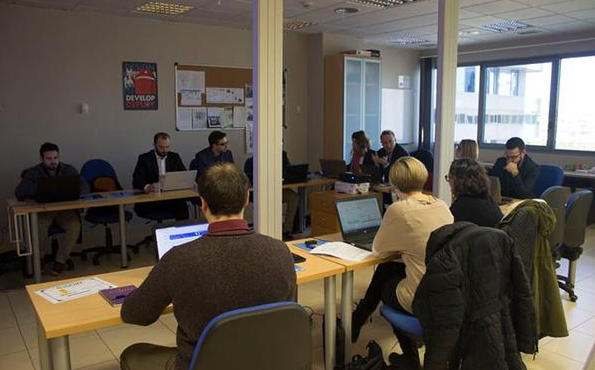 The first project meeting of SOPHIA after the kick-off s took place in Sevilla, Spain the 16th of January 2015. 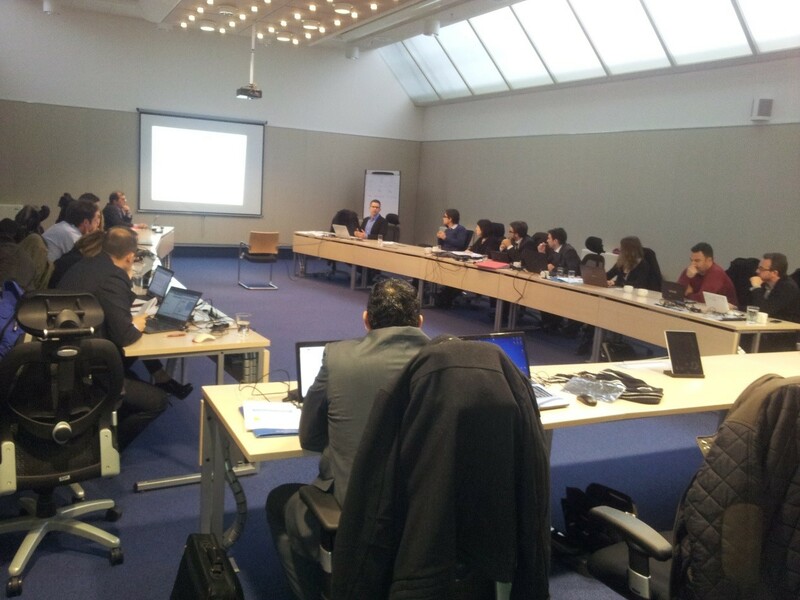 SOPHIA project meeting was attended by all project partners and reviewed results from WP2 regarding user requirements. 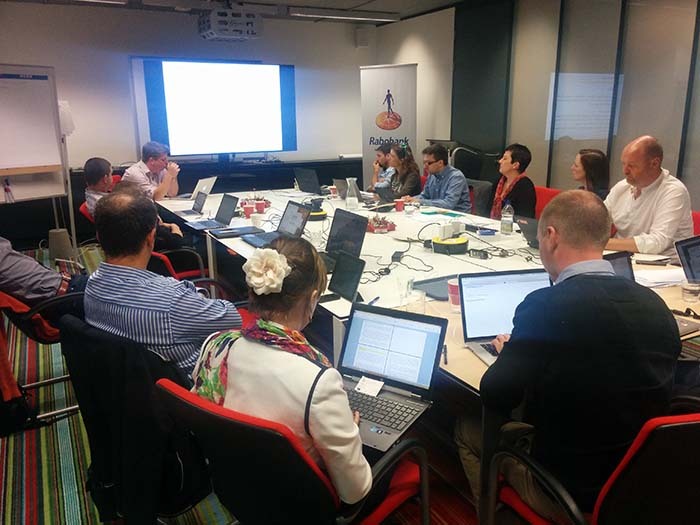 Entering grant preparation phase for LARA project. 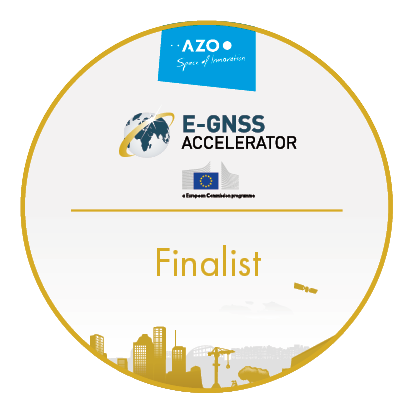 GeoImaging Ltd is happy to announce that since September 2014 has entered the Grant Preparation procedure for the H2020-Galileo-2014-1 project Lara “LBS Augmented Reality Assistive System for Utilities Infrastructure Management through Galileo and EGNOS”. 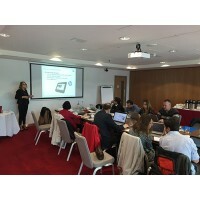 GeoImaging Ltd will act as the coordinator of a 9 partner international consortium that has the main objective to develop a mobile device for utility field workers. The hand-held device integrates different technologies such as: positioning and sensors (GNSS), Augmented Reality (AR), GIS, geodatabases, etc. In practise, this device will guide the field workers in underground utilities to ‘see’ what happening underworld, like an “xray image” of the underground infrastructure. The system is using AR interfaces to render the complex 3D models of the underground utilities infrastructure such as water, gas, electricity, etc. in an approach that is easily understandable and useful during f ield work. 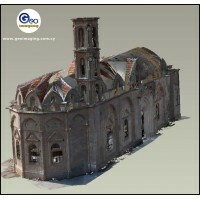 The 3D information is acquired from 3D GIS geodatabases. 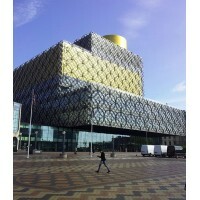 It must be underlined that another SME from Cyprus, SIGNALGENERIX Ltd, is also participating in the consortium. 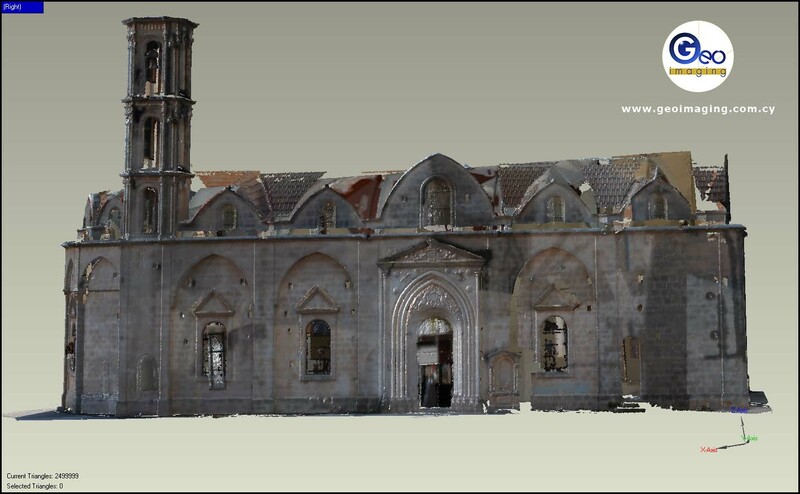 More information on LARA project will be available soon.